With a medium-deep smooth chocolate malt, this smells of ripe apples and demerara sugar. It is full in the mouth and fruity despite the firm bitterness. Edged with butterscotch and toffee, it finishes spicy and dry, with a hint of nuttiness. A warm beer for a cool day, to have with game pie or chocolate. Roasted taste, ranging from bitter to sweet caramel. ?Sharp, full-bodied and dark brown in colour.? Leffe Brown is an authentic abbey beer. Both its deep, dark brown colour and its full, slightly sweet flavour can be ascribed to the use of darkly roasted malt, making every sip just as exceptional as the last. Leffe Brune is the perfect balance between a discreetly bitter, yet slightly caramelised taste. Hints of coffee and chocolate provide this beer with an even more desirable flavour. 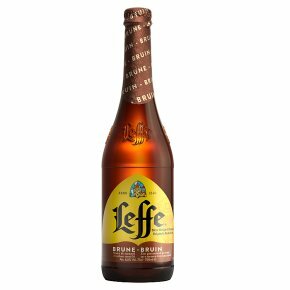 Leffe Brune is also ideally paired with aperitif snacks or cheese and it goes perfectly with spicy, caramelised or sweet and sour dishes. Leffe Brune is ideally served at 5-6°C in a beer chalice, which will allow all the flavours to come through.